This study aimed to assess radiological changes of the ankle joint, subtalar joint and foot following the correction of varus deformity of the knee with total knee arthroplasty (TKA). It was hypothesized that following the correction of varus deformity by TKA, compensatory reactions would occur at the subtalar joint in accordance with the extent of the correction. 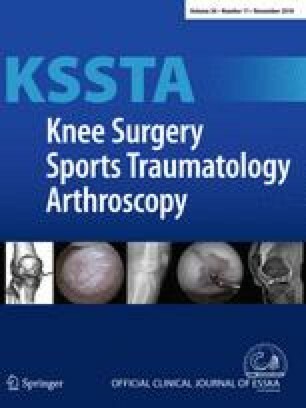 For this prospective study, 375 knees of patients who underwent TKA between 2011 and 2012 were enrolled. The varus angle of the knee, talar tilt of the ankle joint (TT), ground-talar dome angle of the foot (GD), anterior surface angle of the distal tibia and lateral surface angle of the distal tibia, heel alignment ratio (HR), heel alignment angle (HA), and heel alignment distance (HD) were measured on radiographs obtained pre-operatively and at post-operative 6 months. The mean correction angle in varus deformity of the knee was 10.8 ± 4.1°. TT and GD changed significantly from 0.4 ± 1.9° and 6.5 ± 3.1° pre-operatively to 0.1 ± 1.8° and 0.2 ± 2.1°, respectively (p = 0.007, p < 0.001). No correlation was found between the preop–postop variance in mechanical axis of the lower extremity (MA) and TT, but there was a strong correlation between the preop–postop variance in MA and GD (r = 0.701). HR, HA and HD also changed significantly post-operatively, and the preop–postop variance in MA showed correlations with the preop–postop variances in HR, HA and HD (r = 0.206, − 0.348, and − 0.418). TT and the three indicators of hindfoot alignment all shifted to varus whereas GD was oriented in valgus. Following the correction of varus deformity of the knee through TKA, significant compensatory changes occurred not only at the ankle and subtalar joints, but also at the foot. The findings of this study are useful in predicting the orientation of changes in the ankle and subtalar joints and the foot following TKA, and in determining the sequence of surgery when both the ankle and knee have a problem. In other words, changes in the parts of the lower extremity below the ankle joint following the correction of varus deformity of the knee must be considered when TKA is planned and performed. Patients who have problems at the ankle, subtalar, and foot joints in addition to varus deformity of the knee are recommended to undergo knee joint correction first. Bi O Jeong, MD, PhD, Tae Yong Kim, MD, Jong Hun Baek, MD, PhD, Hyuk Jung, MD and Seung Hyun Song, MD declare that they have no conflict of interest. This study was approved by the institutional review board at the Kyung Hee University Hospital (KMC IRB 1336-02). Informed consent for study participation was obtained from each patient.